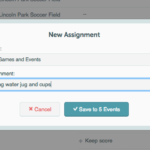 One of the not-always-obvious features of TeamSnap is the ability for team managers to set a “cut-off time” before a game or event. This is the time after which players can no longer change their availability. For instance, if you have a 7 p.m. game, you might set the cut-off time to five hours so no one can change their availability after 2 p.m. Team Managers can set cut-off times for games and events by clicking the Availability Preferences button on the Availability page. But one of the minor issues we’ve seen is that players aren’t always aware that this feature exists, so they sometimes wonder why they can’t change their availability for a specific game or practice. So we’ve added a message to the top of the Availability page if a player is looking at the page and any of their games or events is within the cutoff window. We hope this will make the situation a bit clearer. Happy playing!